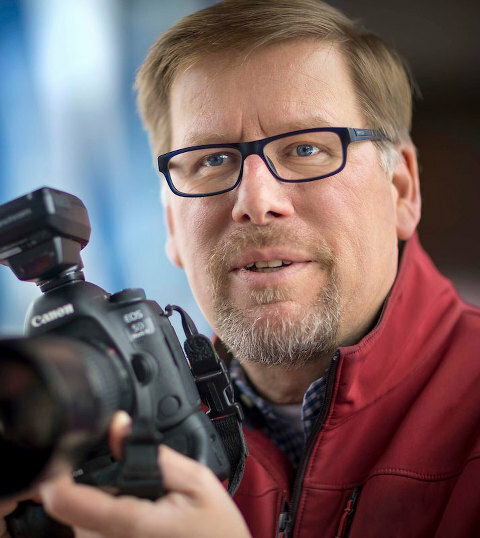 Wisconsin Editorial Photographer and Wisconsin Commercial Photographer Mike Roemer’s blog. Hi, I'm Mike Roemer, a commercial, corporate, industrial, agriculture and editorial photographer based in Green Bay, Wisconsin. I've lived the photography business since childhood, first tagging along during my father's long newspaper photography career before ever carrying my own camera gear. My interest grew as I watched the fascinating process of my dad making black and white images appear while shaking trays of chemicals under the red lights of a developing room. My professional career started with a ten-year stint as a newspaper photographer meeting tight deadlines, adapting to curve balls and making the famous and not-so-famous comfortable in front of my lens. I returned to Green Bay in the mid-1990s to start my own business, and now regularly travel around the U.S. and internationally for my clients. I enjoy the creative challenge of combining unusual angles, lighting and lens options to produce the perfect commercial image. I've won first place awards in Pictures of the Year International, National Press Photographers Best of Photojournalism and National Headliners, along with being a three-time winner in the Pro Football Hall of Fame photo contest. I love the variety of projects I get to work on, from healthcare organization and foundation annual reports, high-energy casino and gaming shoots, industrial projects at locations as diverse as cheese manufacturers and steel plants, to corporate culture assignments and documenting the Green Bay Packers. Since I started this blog back in November of 2009, I’ve put together a best of blog from that year’s work. I always start out with more images than I should probably post and painfully work hard to narrow down that number. For me it’s tough to keep my emotion out of my decisions as to which shots are the best. My favorites aren’t always the ones that get the most likes on social media, but the ones that mean the most to me personally or the ones that I think help take my business and my vision as photographer in the direction I want to go. This past year I’ve tried to push more into the area of agriculture photography so I assigned myself a couple of personal projects, with the main one of documenting daily life at a family dairy farm. A number of those images made it into this best of blog and that makes me very happy. I also tried to shoot more for my stock photography submissions as I push more into that realm. A number of those photos not only are included in this best of blog, but also rose to the top. Shooting personal work, self assignments and stock work are important to me and to most photographers since it helps keep the portfolio fresh and maintains a consistent vision; shooting images one likes also makes for a happy photographer It can be tough to make time to shoot this personal work if you’re busy with commissioned work – I’ve been guilty of this in the past. However, after seeing the images and experiencing the joy that work brought to me and others in 2018, I know I need to make time for it going forward and I’m excited about that. I’ve been working on it already, but one of my main goals early in 2019 will be to come up with a list of personal projects to work on for the year. I’m always up for suggestions; if looking over this body of work inspires any ideas from viewers – from interesting agriculture situations to unique portrait ideas – please let me know. A brave Addie Beauchamp jumps in to the water while tubing with family on the Fox River. Portrait of New Holstein, Wisconsin firefighter Scott Schmitt. A mom and her daughters take advantage of a fresh snow fall for an afternoon of sledding at Pinecrest Historical Village near Manitowoc, Wisconsin. Green Bay Packers defensive back Bashaud Breeland celebrates his interception for a touchdown with a Lambeau Leap. Izzy Kellner plays with puppies in St Anne, Wisconsin. With late day storm clouds rolling over farm land near Denmark, Wisconsin a trucks headlights light up the road. Jeremy Schlies gets a loving nudge from one of his cows as he washes another in preparation for the county fair. Green Bay Packers wide receiver Geronimo Allison prays before a game. One of my favorite photos from a personal project focused around Brad Allen and how he is trying to hand down a family tradition of maple syrup making to his sons. That’s Brad’s mom and brother taking a ride around the sugar bush near Suamico, Wisconsin. Rolling hills of corn near Denmark, Wisconsin. Executive portrait for Bay Tek Games. Caleb Griswold, the “Mayor of Muttland Meadows”, a private dog park in Grafton, Wisconsin. Tyler Selner fills a bowl with fresh milk for a group of barn cats after milking. Inspection of concrete pipes at County Materials in Marathon, Wisconsin. Casey Tisler and Jeremy Schlies do a deep clean of a tractor in preparation for Take Your Tractor To School Day at Denmark High School. Dust kicked up by a combine in late day light as corn is harvested. Tractors caravan down main street in Denmark, Wisconsin as they head to the school on “Take Your Tractor To School Day”. Corporate culture photos for Immel Construction in Green Bay, Wisconsin. Slot machine action at Ocean Down in Ocean City, Maryland. Chaz and Megan Self at their farm near East Troy, Wisconsin. A happy cow tosses feed in the air. A car breaks tough a bank of low lying early morning fog near St Anna, Wisconsin. Jeff Wunrow works on an afternoon feeding at his farm near Potter, Wisconsin. Sunrise at Horicon Marsh near Horicon, Wisconsin. One of my favorite photography personal projects this year was an agriculture photography project recording daily life at Old Settler’s Dairy near Denmark, Wisconsin. The farm is run by David and Donald Schlies and the brothers were nice enough to allow me access to hang out and record their daily life. I tried to get out to the farm as often as I could, but with other shoots on my schedule and just daily life, I was only able to visit them twice a month or so. Still, my time there was filled with unforgettable and beautiful images; with my ten year stint as a newspaper photographer in South Dakota, I’d shot plenty of agriculture stories, but I don’t think I saw the beauty that I currently do on the farm. My interest in agriculture photography has grown after meeting my wife Judy twelve years ago and hearing her entertaining and heart-warming stories about growing up on a dairy farm. Her family gatherings are often filled with reminiscences of farm life – from chasing wayward cows to delivering calves in less than ideas conditions. Sadness and loss are also part of the farm story, whether it be the loss of a beloved pet to wild animals or the loss of a crop due to a drought. This range of emotion creates a deep connection between farm families and their land and animals. My goal was to try and record those moments with the Schlies family. Growing up a city kid, I thought mowing the lawn and helping with the dinner dishes was hard work. The Schlies kids put that theory to rest as I saw them get out of bed as the sun rose to put in a few hours of work before school. After school included more farm work as well as homework. Despite this, these kids impressed me with not only their strong work ethic, but the joy in which they carried out their day to day tasks. Even the youngest Ryan had responsibilities to the farm, with the older twins, Jeffery and Jacob stepping in to help when the job became too big for an 8 year old. Watching the boys bomb around on their 4 wheelers in between chores made me think there might be some perks to all that hard work. The oldest of that next generation is Jeremy who is a senior at Denmark High School. You can tell he would love to spend the rest of his life working on the farm, but Jeremy is a smart young man and he is aware of the challenges of running a family farm like Old Settler’s Dairy; small family farms are disappearing at an alarming rate with the trend toward large, corporate farms. Jeremy has mentioned a few back up plans that which involve staying in the ag world. With his amazing work ethic, he will succeed at wherever he does. The first morning I spent at the farm, Jeremy mentioned to me that one of the cows would soon be giving birth. I hung out near her, where I learned and photographed some amazing things about birth. The most descriptive picture isn’t included in this blog because it’s a little too graphic, but so depicts farm life. One of the other moments I will remember is watching eight year old Ryan feed calves one summer morning. Ryan wasn’t much bigger than the calves he was bottle feeding. In the photo below, I love how Ryan is so focused on the job of bottle feeding one calf while the other curiously licks his arm. I learned just how curious and affectionate cows can be; the photo of Jeremy washing one cow while the other gives him a loving nudge depicts this well. I also learned this first hand when I was laying along the side of a field of winter wheat trying to get some interesting details shots, and I heard what sounded like heavy breathing behind me. I turned around and found myself looking up at the faces of my bovine investigators, who were checking out what this city kid was up to. Another moment I will remember was watching Jeremy and Casey Tisler, a family friend that also works on the farm, cleaning up an old tractor. I thought it made some interesting shots, but also found it odd as to just how much of a deep clean they were giving that tractor. I mentioned that to Jeremy’s dad David, who told me they were getting the tractor ready for Take You Tractor To School day the following morning. David also told me it wasn’t just that tractor they were getting ready, but two more so both Jeremy and Casey could drive to school. Jeremy’s mom Julie who teaches in Denmark, also planned to get in on the action with the third tractor. I knew that would make for some great photos so I made sure I got back out that next morning. You can find a blog post I did on that at this link. I had planned to just spend one planting season documenting life on this dairy farm, but after this experience I know I will want to return not only for the great photos, but also for the warmth and camaraderie the Schlies family showed me. I’m grateful for their authenticity both in front of the lens and without it. I’ll be looking for some other agriculture photography opportunities for the coming year so if anyone reading this blog has any ideas, please reach out. Ryan Schlies bottle feeds calves as part of his morning chores. A group of curious cows check me out as I try and get some detail shots in a neighboring field. A cow licks her calf clean movements after giving birth. A group of expecting cows surround another as she nudges her new born calf to stand moments after giving birth. Rows of corn early in the growing season. Ryan Schlies is all smiles as he cruises around the family farm on his four wheeler. Tyler Selner runs in his work boots as he tries to redirect a cow as he tries to get it in to a pen. Jacob Schlies hugs one of the cats on the farm. Jacob Schlies and his twin brother Jeffrey keep an eye on the arriving competition as they prepare a cow to be shown at the county fair. David Schlies has the attention of a curious calf as he works on morning feeding. Twin brothers Jacob and Jeffrey Schlies. David Schlies adjusts his cap as he works on spring planting. The sun glistens off dew in a field of corn. Jeffrey Schlies works on a feeding as part of his farm chores. Julie Schlies arrives on a four wheeler with more food for the days crew during lunch. Casey Tisler and David Schlies exchange thumbs up as they pass during a harvest. Amazing clouds as Julie Schlies harvests a field of oats. The sun rises over a field of corn. The sun pokes through a field of corn. Donald Schlies harvests a field of corn. Donald Schlies heads back with a load of corn as he tries to get ahead of an incoming storm. More curious cows checking me out. Clouds from a late day storm. Very excited announce three of my photos from the past year have been chosen by the staff at Photoshelter as their “Shot of the year”. You can view the rest of the selected photos by 41 photographers from around the world that use the amazing Photoshelter product as their archive and website at https://shotoftheyear.photoshelter.com/index One of the things that makes me most proud of these three photos is they all came from personal work that I’ve done this year for my portfolio, but also for my venture in to the world of stock photography with Aurora Photos. Ryan Schlies, age 8, works on his morning chores at his families dairy farm, Old Settler’s Dairy, near Denmark, Wisconsin. This photo was part of a body of work produced on a year long personal project on the family farm. New Holstein, Wisconsin firefighter Scott Schmitt. A brave six year old Addie Beauchamp jumps in to the Fox River in De Pere, Wisconsin while tubing with family. Sunday’s Green Bay Packers game against the Atlanta Falcons was the first game of a new era for the Packers with Joe Philbin at the helm as the interim head coach. Mike McCarthy was fired as head coach after last Sunday’s lose to the Arizona Cardinals. The Packers defeated the Falcons 34-20 to put their season record at 5-7-1 and keeping a slim chance of making the playoffs alive. Here are some of my favorite photos from telling the story of the game. Packers fan Jeff Kahlow shows his support for interim head coach Joe Philbin. Green Bay Packers quarterback Aaron Rodgers tries to escape the presser of Atlanta Falcons defensive tackle Jack Crawford. Green Bay Packers wide receiver Davante Adams pulls in a pass as Atlanta Falcons free safety Isaiah Oliver defends. Atlanta Falcons outside linebacker De’Vondre Campbell wrestles down Green Bay Packers quarterback Aaron Rodgers. Green Bay Packers defensive back Bashaud Breeland returns an interception for a touchdown. Green Bay Packers defensive back Bashaud Breeland celebrates his pick six. Atlanta Falcons cornerback Brian Poole hits Green Bay Packers quarterback Aaron Rodgers after the quarterback slides after giving himself up after a first down run. Green Bay Packers offensive guard Lucas Patrick shows his displeasure with Atlanta Falcons cornerback Brian Poole hit on quarterback Aaron Rodgers on what he considered a late hit. Green Bay Packers quarterback Aaron Rodgers tries to ge away from the defensive pressure of Atlanta Falcons defensive end Bruce Irvin. Green Bay Packers quarterback Aaron Rodgers gets rid of the ball as Atlanta Falcons defensive end Bruce Irvin applies defensive pressure. Green Bay Packers cornerback Jaire Alexander breaks up a pass intended for Atlanta Falcons wide receiver Julio Jones. Green Bay Packers running back Aaron Jones tries to get away from Atlanta Falcons defensive tackle Deadrin Senat and cornerback Brian Poole. Atlanta Falcons quarterback Matt Ryan and Green Bay Packers quarterback Aaron Rodgers hug after the game. Green Bay Packers interim head coach Joe Philbin runs off the field after the Packers defeated the Falcons. Green Bay Packers quarterback Aaron Rodgers high fives fans as he walks off Lameabu Field after the Packers defeated the Falcons. Here are a few of my favorites from cover the Green Bay Packers vs Arizona Cardinal football game at Leambeau Field in Green Bay, Wisconsin on December 1, 2018. The Packers are having a down year, but everyone had predicted them to have a bounce back game against the Cardinals, who are having an even more down year then the Packers. That predication was wrong and the Cardinals defeated the Packers 20-17. The Packers had a chance to push the game in to OT with a last second field goal, but Mason Crosby kick went wide right. During the game I tried to get some photos of Packers head coach Mike McCarthy. With the past two down years McCarthy was said to be on the hot seat. A few hours after the game we learned that hot seat was red hot and McCarthy was fired after 13 years with a 125-77-2 regular season record and 10-8 in the postseason, including one Super Bowl win. Usually I can get some shots of McCarthy and Rodgers talking during timeouts while the Packers are on offense, but for some reason that didn’t happen much on Sunday. Snow cover seat inside Lambeau Field before the Packers Cardinals football game. Equipment managers test out audio in helmets on Lambeau Field before an NFL football game between the Green Bay Packers and the Arizona Cardinals. Green Bay Packers wide receiver Davante Adams celebrates scoring a touchdown. Green Bay Packers’ Head Coach Mike McCarthy. Green Bay Packers wide receiver Davante Adams is hit after making a catch by Arizona Cardinals defensive back Leonard Johnson. Green Bay Packers wide receiver Marquez Valdes-Scantling jumps to make a catch while being covered by Arizona Cardinals defensive back David Amerson. Arizona Cardinals quarterback Josh Rosen breaks free for a long run during the second half. Arizona Cardinals running back Chase Edmonds rushes for a touchdown. Green Bay Packers running back Jamaal Williams is hit during a run by Arizona Cardinals strong safety Budda Baker. Arizona Cardinals running back Chase Edmonds gets tripped up by Green Bay Packers cornerback Jaire Alexander. Green Bay Packers running back Aaron Jones rushes for a touchdown. Green Bay Packers quarterback Aaron Rodgers rushes towards the sidelines as Arizona Cardinals strong safety Budda Baker defends. Green Bay Packers kicker Mason Crosby and punter J.K. Scott react after missing a last second field goal. Green Bay Packers quarterback Aaron Rodgers and Arizona Cardinals quarterback Josh Rosen talk after the game. Green Bay Packers quarterback Aaron Rodgers and Arizona Cardinals wide receiver Larry Fitzgerald talk after the game.